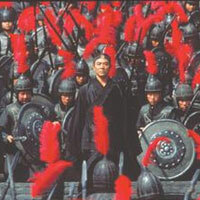 Cast: Jet Li, Tony Leung Chiu Wai, Maggie Cheung, Zhang Ziyi, Daoming Chen, Donnie Yen. Story: Assassins try to kill the King of China, a Hero intervenes. Did you ever see a movie and come out wondering if you'd completely missed the point? That's how I feel right now having seen Hero. I watched carefully, I understood it, I followed the plot, yet still I can't help feeling I was watching on the wrong level. All the time the characters are banging on about honour, courage and all kind of eastern promise, while their actions are those of spaced-out teenagers. I was genuinely surprised when I found out that Hero was actually a Chinese film - it has the feel of a Western director who has watched oriental films and thinks he can do better. Thus we are bombarded with visual tricks, we are bamboozled by novel temporal distortions, but we resist the inherent suggestion that this is a deep and meaningful masterpiece, because it most certainly isn't. I can't get far through this review without mentioning Crouching Tiger, Hidden Dragon. It may share a cute actress - Zhang Ziyi - but that's not why I have to talk about it. Hero uses the same I-can-fly wire effects that Crouching Tiger did, and they look exactly the same, which in my eyes means unconvincing and amateur. I read the reviews of Crouching Tiger before I saw it and I was prepared to accept the fact that the fighters could defy gravity and perform superhuman acrobatics. The problem is that most of the time they are doing believable stuff - regular fight scenes as we westerners are used to - then all of a sudden one of the combatants floats 30 feet into the air or rolls slowly forwards as if riding on a shopping trolley in the frozen food aisle at Sainsbury's and thus the illusion is shattered. To make this kind of hokum congruous, we need to see the borders. As well as the extremes, we also need to see things that are only marginally unreal to bridge the gap between magic and normality in our heads, otherwise it just looks like camera tricks. "These are not the droids you are looking for" - Alec Guinness's seminal line in Star Wars - was a perfect example of breaking us in gently to the weird and wonderful things that "The Force" could do, and thus when Luke Skywalker turned his targeting system off in the trenches of the Death Star, we bought it, we rode with it and we cheered. In Hero, as with Crouching Tiger before it, there is no such connection, so the viewer will always feel jarred and disbelieving whenever anything magical happens. Now don't get me wrong, this isn't a terrible film. It keeps the viewer interested and intrigued, it has a story to tell (albeit a morally confusing one) and it has a lot of creativity to share, particularly in the visuals department, where clearly a great deal of attention has been paid to create a lavish and innovative look. The problem is that it treats itself as a seminal epic, when in reality it's a fairy tale. There isn't a single scene that doesn't require the performers to maintain expressions as intense as a murder trial - everything is played up so excessively far that you could put it straight into a Harry Hill comedy and it would fit seamlessly. At one particularly significant point, a character is deluged by a coruscation of arrows as he's leaning against a wall, then we are shown that he has died by panning to a man-shaped hole in the mass of arrows that have lodged in the wall - a piece of unintentional comic imagery that Monty Python would have been proud of. The only reason the movie theatre is silent is because of the expectation of everyone who is actually persuaded to buy a ticket, because of the image projected by the marketing. We're expecting something intellectual, we're expecting to think, we're expecting to be provoked. Half way through all of us - except for the slightly scary man who's leaning forward in his seat and might be about to shout at the screen - realise that it's not coming. We have been stood up - and having been promised a sophisticated authoress for our evening's entertainment, instead we're left in the company of an empty-headed bimbo with a vastly inflated self-image. She looks the part and she moves like a supermodel, but as soon as she opens her mouth we know we won't be asking her back for coffee. Hero is the Naomi Campbell of movies. I think the average moviegoer will enjoy it: 2/5, though there will be a wide spread of opinion. There will be a lot of people who love it, a lot who think it's tripe, and a further mass who thought it was OK but don't see what all the fuss was about. Rent Crouching Tiger, Hidden Dragon first, as your opinion will be transferable. Testosterone Satisfaction Rating: 1/5 Lots of fights but they're a tad girlie. To enjoy this film you should be: stoned or pretentious.